What is Highly Accelerated Life Testing (HALT)? What’s the difference between ALT, HALT, HASS Testing procedures? The stresses applied during a HALT test are not meant to simulate those expected in the field but rather are to expose any weak components that should be upgraded to produce a more reliable end product. 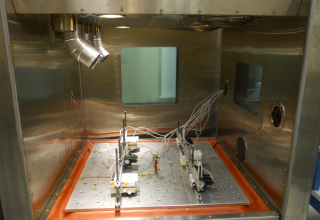 Accelerated Life Testing (ALT) is a “life test” designed to confirm product longevity and expected failure rate under simulated field conditions. This process allows long duration field performance to be measured in a relatively short period of time in the laboratory. Highly Accelerated Stress Screens (HASS) is used to screen individual components at a stress greater than their capacity or expected normal use, to simulate extreme cases of storage, shipping or use. This exposure will help pinpoint weak product components. Highly Accelerated Life Testing (HALT) is used prior to product manufacturing, in a product development phase, to determine which individual components can withstand the applied stresses (thermal or voltage) the best and that should be included in a product. Why use Percept for your HALT? Percept has been providing quality and dependable reliability testing, including HALT, since 1996 to the Boulder, CO area as well as nationally. Percept understands that if the wrong tool is used or the right tool is misused, product reliability data can be inaccurate ending in disastrous problems for the company. We strive to produce accurate data analysis so that you can be confident that when a finished product is manufactured, it will be reliable and reputable.